Pythagoras of Samos, 570 — 495 BC, was an Ionian Greek philosopher and religious leader who was responsible for important developments in the history of mathematics, astronomy, and the theory of music. Pythagoras is often described as "history's first pure mathematician". Around 532 BC, he migrated to Croton in southern Italy from Greece, where he founded a philosophical and religious school that attracted many followers. The most important discovery of this school was the fact that the diagonal of a square is not a rational multiple of its side. In essence, this showed the existence of irrational numbers. 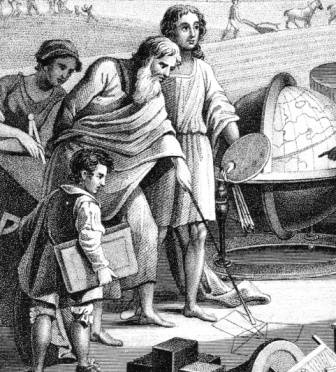 The discovery of the school Croton disturbed Greek mathematicians and the Pythagoreans themselves, who believed that whole numbers and their ratios could account for geometrical properties. Pythagoreans believed that all relations could be reduced to number relations ("all things are numbers"). The Pythagoreans knew, as did the Egyptians before them, that any triangle whose sides were in the ratio 3:4:5 was a right-angled triangle. The so-called Pythagorean theorem, that the square of the hypotenuse of a right triangle is equal to the sum of the squares of the other two sides, may have been known in Babylonia, where Pythagoras traveled in his youth. The Pythagoreans, however, are usually credited with the first proof of this theorem. The Pythagorean theorem says that: In a right-angled triangle, the sum of the squares of the measures of the legs (sides adjacent to the right angle) equals the square of the measure of the hypotenuse (side opposite to the right angle). Converse of the Pythagorean theorem: "If the sum of the squares of the measures of two sides of a triangle equals the square of the measure of the longest side, then the triangle is a right angled triangle". The converse theorem can be used to determine whether three measures of the sides of a triangle are those of a right triangle. Let 'a', 'b', 'c' denote the legs and the hypotenuse of the given right-angled triangle. 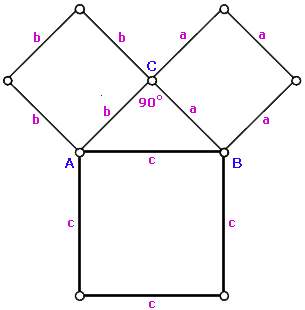 Consider the two squares in the adjacent figure, each having a + b as its side. The first square is dissected into five pieces: the square on the hypotenuse and four right-angled triangles congruent to the given triangle. 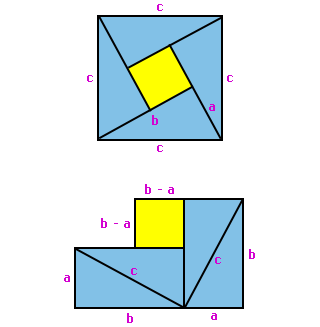 The second square is dissected into six pieces: the two squares on the legs and four right-angled triangles congruent to the given triangle. By subtracting equals from equals, it now follows that "the square on the hypotenuse is equal to the sum of the squares on the legs". Consider the adjacent figure. 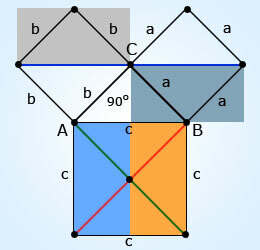 The area of the first square is given by: (a + b)2 or 4( ab) + c2. 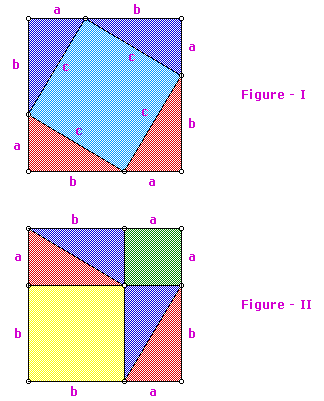 The area of the second square is given by: (a + b)2 or 4( ab) + a2 + b2. Since the squares have equal areas, we can set them equal to another and subtract equals. The case (a + b)2 = (a + b)2 is not interesting. Let's do in another way. Consider the shaded regions as being moved from the small squares into the large square. 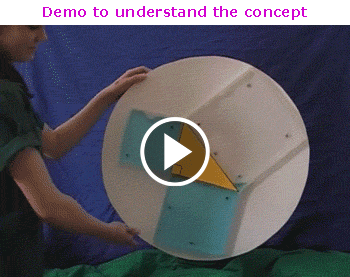 Moving all four such regions shows that: a2 + b2 = c2. With the addition of just three lines, the proof of the theorem is simplified. Try for yourself before seeing the solution in the adjacent box. The twentieth President of the United States, Garfield, gave the following proof to the Pythagorean Theorem. His proof is based on the fact that the area of the trapezoid is equal to the sum of the areas of the three right-angled triangles that can be constructed in the trapezoid. He used the adjacent trapezoid in developin g his proof. First, we need to find the area of the trapezoid by using the formula A = h(b1 + b2). In the adjacent figure, h = a + b, b1 = a, and b2 = b. By substituting h, b1 and b2 values in A = h(b1 + b2), we get: A = (a + b)(a + b) = (a2 + 2ab + b2). Now, let's find the area of the trapezoid by summing the areas of the three right-angled triangles. (a2 + 2ab + b2) = (2ab + c2). By solving this relation, we get: a2 + b2 = c2. Indian born Bhaskara, also known as Bhaskaracharya (1114 – 1185), was one of the most important Hindu mathematicians of the second century AD. He used the adjacent figures in proving the Pythagorean theorem. The blue triangles are all congruent and the yellow squares are congruent. 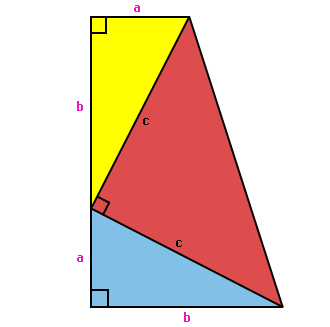 First we find the area of the big square as: A = c2. Now, lets arrive at the area of the same square by finding the area of each of the components and summing them. 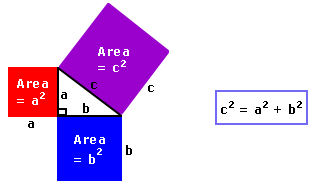 Since this area is equal to the area of the big square, we have: c2 = b2 + a2. Animation demonstrating the simplest case of the Pythagorean Triple: 32 + 42 = 52. There are 52 Pythagorean triples with c ≤ 100 out of which 16 are primitive triples. Click for details. A set of three positive integers (a, b, c) that satisfy the equation a2 + b2 = c2, where 'c' is the greatest number, is called the Pythagorean triple. The smallest and best–known Pythagorean triple is (a, b, c) = (3, 4, 5), in which the sides of a right-angled triangle are in the ratio 3:4:5. A primitive Pythagorean triple is a Pythagorean triple with no common factors except 1, i.e., (Pythagorean triple with co-primes). Ex: (3, 4, 5), (5, 12, 13), (8, 15, 17), etc. (6, 8, 10) is not a primitive triple. The Pythagorean triple (3, 4, 5) is the only primitive Pythagorean triple involving consecutive positive integers. If the measures of the sides of any right-angled triangle are positive integers, then the measures form a Pythagorean triple. Ex: 11, 60, 61; 39, 80, 89; 28, 195, 197; etc. If (a, b, c) is a Pythagorean triple, then (na, nb, nc) is also a Pythagorean triple for any positive integer 'n'. Euclid's formula for generating Pythagorean triples: This is a fundamental formula for generating Pythagorean triples given an arbitrary pair of positive integers 'm' and 'n' with m > n. The formula states that: "for any two positive integers 'm' and 'n' with m > n, a = m2 – n2, b = 2mn, c = m2 + n2 form a Pythagorean triple." Note: The Pythagorean triple generated by Euclid's formula is primitive if and only if 'm' and 'n' are co-primes and (m – n) is odd. If both 'm' and 'n' are odd, then 'a', 'b', and 'c' will be even, and so the triple will not be primitive; however, dividing 'a', 'b', and 'c' by 2 will yield a primitive triple if 'm' and 'n' are co-prime. Aspect ratio and diagonal length of the screen determine the optimum viewing distance. Ex 1: Robert wants to instal a wall-mounted HDTV in his home theatre. The distance between the wall and sofa is 8 feet. If the TV manufacturer recommends a viewing distance of twice the diagonal of the TV screen, which of the following size suits him better ? a) 36" × 28" b) 38" × 30"
Sol: Using the Pythagorean theorem, we calculate the diagonal (D) of the TV screen. a) D1 = ≈ 45.6". Optimum viewing distance = 2 × 45.6 = 91.2" = = 7.60'. b) D2 = ≈ 48.4". Optimum viewing distance = 2 × 48.4 = 96.8" = ≈ 8.07'. Since D2 is closer to the 8' distance between the TV and sofa in the room, option (b) suits better. Ex 2: A hospital wants to convert a 4-step staircase, each step of 6" height, into a ramp. As per construction norms, the ramp should be at an optimum distance of 8 feet from the base of the porch. What will be the length of the ramp ? 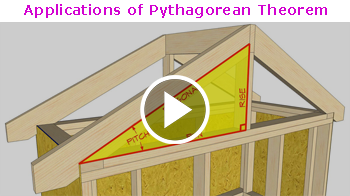 Sol: Since there are 4 steps of 6" each, the height of the porch from the ground is 24" or 2'. 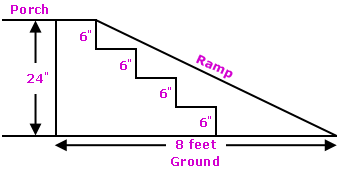 Ramp length is the hypotenuse of the right-angled triangle and is obtained from the Pythagorean theorem. Refer adjacent figure. Length of the ramp = ≈ 8.25'. Ex 3: You are locked out of your house! However, there is one open window at a height of 20 feet and beneath the window on the ground is a backyard garden of 6 feet width. Will a ladder of length 20.5 ft be sufficient to reach the window ? 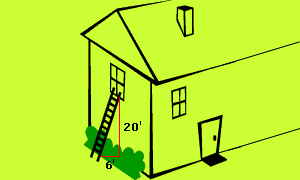 Length of the ladder = ≈ 20.88'. So, a ladder of 20.5' length is insufficient. You require a ladder with minimum length of 21' approx. Ex 4: In a game of baseball, you are at the first base and just picked a ground ball. You spot an opponent running toward third base already rd from the second base with an average speed of 15 ft/sec. At what speed should you throw the ball to run him out ? Sol: Refer adjacent figure. 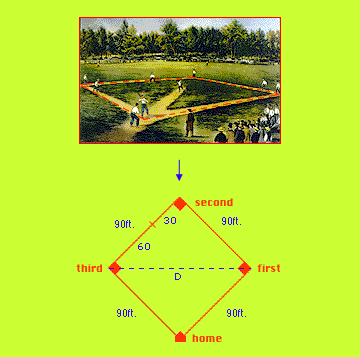 The shortest distance from the first base to third base (D) is calculated from the Pythagorean theorem. So, to run him out, your throw should reach the third base in less than 4 sec. Hence, the throw speed should be greater than or 31.82 ft/sec. Distance between two points (x1, y1) and (x2, y2) is calculated as: using coordinate systems. For the addition of two vectors and multiplication of vectors. In construction of triangular shaped roofs, pyramids, stair-cases, ramps, etc.